A Google Algorithm Update Brewing Now? 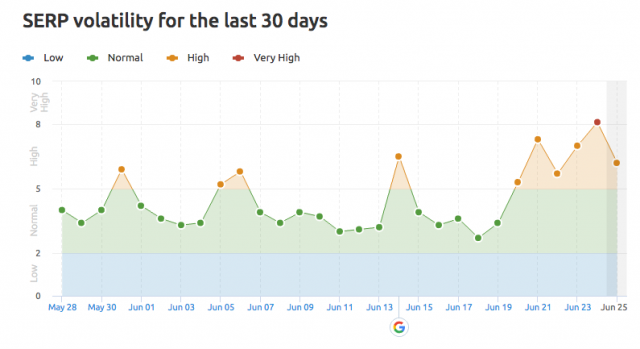 Home > Google News > Google Updates > Google Algorithm Update Brewing? Maybe. Google Algorithm Update Brewing? Maybe. I received a few emails yesterday, saw some comments on this site and on WebmasterWorld and the tools are still pretty high in tracking volatility - there may be a Google search algorithm update brewing right now. It is way early, the SEO chatter at these levels do not convince me fully that there is an update versus a blip for a couple of hours in the search results. I'm convinced on June 25 a massive algo update happened. I've seen major shifts on 3 different websites. Terms that were once getting them top listed no longer do. What's more, older articles from the web seem to be outranking newer, more substantive content. I did a random check on several websites and talked to two webmasters. They've observed the same thing. Something is absolutely going on. This weekend and today I feel a shuffle of Google results with a lot of spam into the light. 1,2,3 position = fixed brand positions, after that a lot of garbage. Many of my product pages seem to be sandboxed. I cannot find them anywhere! Massive, massive update. Looking into pages/KWs affected right now, record day yesterday for sales/leads. Again, the chatter from our SEO community is very quiet right now but that might change or it might not. I'll keep an eye on it. Did you notice massive changes? If so, let us know in the comments or start chattering about it and I'll find it.